As a business owner, you know that you need to protect data, both for yourself and your customers. You need a solution to do that for you, but there’s always a risk that it might fail. Data backup involves taking a copy of all the data your business holds and storing it securely. In the event of a cyber breach or information being corrupted or lost, the copy can be used to restore the data. To get the most out of the solution, data needs to be backed up regularly so that the most up to date information is restored. There are various ways to back up your data, and you can choose to store the information at your office or premises or offsite somewhere else. The more data you have, the more space you’ll need for storage. Tape backup has long been a popular choice for data backup because it’s cheap and scalable – as your data grows, you add more tapes. They can be held on or offsite, and restoring information from them can be quite fast, provided you can access the tapes quickly. However, with the introduction of GDPR legislation last year, tape may no longer be a practical option. The ruling gives every EU citizen the right to request that personal information a company holds on them is deleted, and businesses need to respond within a month. If the data held about an individual is on a backup tape (which can be used as an archive as well as for restoration) it may be time-consuming to find the correct tape. There is a possibility that the tapes are corrupt, or if you’ve upgraded your system you can no longer read the tape. Cloud, or online backup, is an increasingly popular choice for businesses of all sizes, as it’s convenient to store data and can be quickly restored. Some cloud storage is free, and other providers charge based on the amount of data held and a number of users. Amazon Web Services and Microsoft Azure are both ‘public’ cloud storage options, or businesses can choose a service provider with a managed data centre. Sometimes, cloud-based data in SaaS (Software as a Service) applications are backed up in another cloud. Data backup options are a personal choice and should be appropriate for your business needs. However, you also need to be aware that they can fail, and the reasons for this can be surprisingly simple. Like any other tool, backup solutions are prone to wear and tear, overheating, mechanical failure, faults or damage from humans or natural disaster (such as the office flooding). 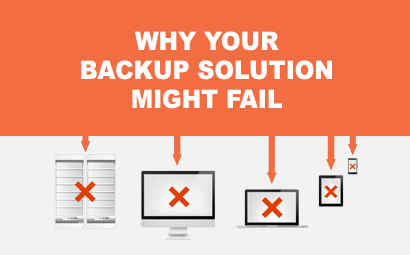 It’s possible that the backup solution is incompatible with another system you’re using, particularly if an application has been recently updated. It’s also easy to wrongly configure the backup software. All hardware ages, and as it does so it becomes less effective. As we’ve mentioned, as technology improves, older tools become obsolete and no longer usable, making it harder to access the data. Tapes, CDs and flash drives can all fail or age too. There’s always a risk that the data has been incorrectly stored and corrupted, particularly if it’s on tapes. It’s also possible that careless handling of the tapes or not following the instructions can cause damage. User errors can also lead to data being erased or wrongly reinstalled. Unfortunately, your backup data is at risk of being corrupted, just as the live data you’re working with is. If that happens, it can’t be fixed. Likewise, the backup is vulnerable to viruses, hacking and other cyber-attacks. It’s not impossible that your network goes down, and potentially for longer than you’d like, or a data restore in event of network failure takes longer than expected. A problem with your network may also prevent you from accessing your backed-up data. ATG offers 5Nines to all of our customers. It’s our hybrid disaster recovery and business continuity solution, designed to get you back up and running in six seconds if there’s data loss or a security breach. 5Nines keeps customers secure and protected 99.999% of the time and ensures minimal disruption to the business. We have robust processes in place to prevent backup failure, and because we take on the responsibility of looking after your data, you don’t have to worry about things going wrong. We make it secure and accessible only to the people who need to view it. We have options for small and large organisations and can help you find exactly the right solution. Using snapshots of your data, which are taken regularly as you share and update documents, you can choose which one to use to roll back to an earlier version of everything you create.